Bathrooms aren’t traditionally the largest room in the home, but we’ve put more emphasis on them in recent years. We want our bathrooms to feel more like a haven in which to relax instead of a small area designed for quick visits. I’m not talking about the half bath, of course the purpose of this little one is to facilitate quick visits and encourage hand washing. My focus today is on the master bath. Life is hectic; I think we can all agree on that. Most homeowners are also parents with responsibilities that extend much further than finding the balance between home and work life. There are also sporting events, dance and music recitals, after school activities, friends homes to visit on weekends, and a myriad of other things that have to be done. Many parents look at their bedroom suite as their getaway from the world and their bathroom is their personal mini-spa. Let’s take a look at a few ways to maximize space in your master bathroom while adding to that spa-like feeling. Remove large, clunky furniture and replace it with stylish space-saving pieces. Remove the linen closet and replace that storage with hidden storage options. Remove the shower stall and opt for a more modern design. Remove the large garden tub; don’t worry, it will be replaced. Utilize unused corners for storage. Build ceiling-height storage cabinets to make use of wall space. Replace your existing tile with a neutral, more natural looking tile. Many people choose to use a very earthy-looking tile when going for a natural spa appearance. Please remember that your choice in flooring sets the style options for the rest of the bathroom. Choose a new toilet in a style that will match the overall feel of the room. Many toilet options in today’s market offer several different functionalities ranging from water-saver to built-in handles for people with limited mobility to built-in bidets. If you enjoy the extra cleanliness a bidet offers but are reluctant to add a separate piece of furniture to the bathroom, choose a toilet with built-in bidet option. Today’s bathtubs also offer a wide array of options. Choose your new bathtub based on your normal usage; if you rarely use the tub and would rather not use up the space by purchasing a new one, skip it and focus more on the shower area. Shower stalls with four walls or that are blocked in with a shower curtain feel a bit claustrophobic. Consider an open shower option that doesn’t leave you feeling trapped. A rainfall shower head in the ceiling provides a wonderful feeling of being connected with nature. Shower-sauna options are available for those who wish to include a sauna in the master bath. They are often equipped with optional benches, music, water jets for massage, and lighting options to zero in on the spa atmosphere. 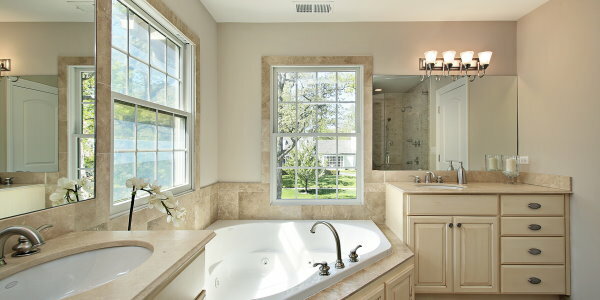 Call us to discuss your options for turning your master bath into your own private spa. We’ll schedule an appointment for a consultation so that we can view your existing master bath and give you our expert opinion on options available to you.